How to save hundreds on your renewal, upgrades, and new tools. It's simple. When you refer any new user to TOTAL, we'll credit your account for 50% of your friend's purchase — even if they add extra products to their software package. 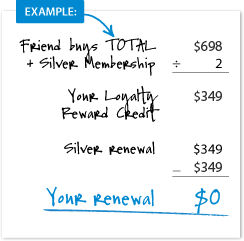 If one of your friends bought a TOTAL + Silver Membership for $698, $349 will be immediately credited to your account. Renew your Silver Membership for FREE! Your Loyalty Rewards are unlimited and easy to redeem. 1-800-ALAMODE and we'll be happy to cover your options. To estimate your potential credits, enter an amount you think your friends would spend in the box below.